They look the same as the 2830/Lincoln/2510 but they're not. Different main PCB and different Processor board to suit the functions of the radio (repeater shift etc). The processor chip can't be modified to give 26-30Mhz as can be done with the other mentioned radio's. I've looked online and found three ways of modifying the 2600 for full coverage. One is to fit a chip switch. The second is to replace the processor chip with one from a Lincoln, 2830 or a 2510. This sounds easy, but it isn't. Finally, I've read a few posts online where people say they've just dropped in the entire processor board from a 2830 and the 2600 has worked fine but obviously without the repeater shift function. Now, I have a full processor board from a very early 2830 which is in perfect working order. I'm definitely not going to attempt unsoldering two processor chips. Chipswitches rarely pop up. So I'm wandering about the whole tray option. Would this actually work? The bulk of the PCB components are the same as the Lincoln etc. The ribbon cable connectors are all identical. So could it simply be a case of drooping the whole 2830 processor board in? The only real difference is the area where the repeater tone setting block is. 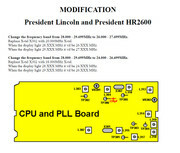 Re: President HR2600 Frequency Expansion. Last edited by 14CS06 on 13 Apr 2018, 20:27, edited 1 time in total. Sounds like a bit of a nightmare Andy . Can I ask . Why do you want to mod it ? It's a good 10m radio as it is . As you know Lincolns/2830s/HR2510s etc are pretty cheap these days . Or as you just looking for something to do ? cb4ever104 wrote: Sounds like a bit of a nightmare Andy . Can I ask . Why do you want to mod it ? It's a good 10m radio as it is . As you know Lincolns/2830s/HR2510s etc are pretty cheap these days . Or as you just looking for something to do ? If all else fails I'll put it back to 10M (simple two minute job) and sell the radio including the 2830 processor board. Someone will get more use out of it as a dedicated 10M radio or have the soldering skills to do the chip swap. Fair enough Andy . Hope you get it the way you want . BTW I wouldn't do that type of de/soldering either . Bit too delicate for me . There is an other possibility to do frequency expansion. It offers also a bunch oft usefull functions too. It is some Kind of a chipswitch. Have a look at www.anesttech.de for your interest. DaJetzi wrote: There is an other possibility to do frequency expansion. It offers also a bunch oft usefull functions too. Have a look at http://www.anesttech.de for your interest. Looks interesting. I'll have to check it out when I get home as it's in German and my phone doesn't offer the translate function. But it certainly looks like it will do the job. Update on this rather old thread. I've managed to fit a Lincoln processor board into the 2600. It now covers from 26 - 30Mhz and works brilliantly. There's no bleep function as that switch was used for the repeater shift. I also decided not to connect the TX button. If I want to TX I'll use the PTT on the mic! It appears that the power output on the 2600 can go much higher than the Lincoln/2830. Into a dummy load it's reading around 50W peak. Good to know Andy . Thanks for sharing .